Valt – Manque is an acrylic drawing in two parts. The first is a timeline of the dispensations of mankind according to the Judaeo-Christian bible. It contains three periods, the Antediluvian Age (before the flood), the Present Age and the Age of Ages (end times). Within each age the periods of dispensation mark the manner of our relationship with God. Each period is also marked by the manner in which it ended. 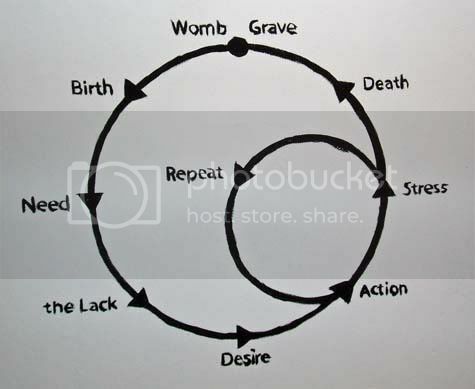 The second diagram is of life, from birth to death, marked by the stages of the lack and the death-instinct according to my interpretation of the theories of Lacan and Freud.